The Kicking Horse River is in the Canadian Rockies of southeastern British Columbia, Canada. The river was named in 1858, when James Hector, a member of the Palliser Expedition, reported being kicked by his packhorse while exploring the river. Hector named the river and the associated pass as a result of the incident. The Kicking Horse Pass, which connects through the Rockies to the valley of the Bow River, was the route through the mountains subsequently taken by the Canadian Pacific Railway when it was constructed during the 1880s. The railway's Big Hill and associated Spiral Tunnels are in the Kicking Horse valley and were necessitated by the steep rate of descent of the river and its valley. Kicking Horse Pedestrian Bridge in Golden is the longest authentic covered timber-frame bridge in Canada. Planned as a community project by the Timber Framers Guild, local volunteers were joined by carpenters and timber framers from Canada, the United States and Europe. The bridge structure is 150 feet (46 m) long, with a 210,000-pound (95,000 kg) Burr arch structure. The bridge was completed in September 2001. The Trans-Canada Highway traverses the river at several points from Yoho National Park to Golden, British Columbia. The river is spanned by the new Park Bridge. Kicking Horse Mountain Resort, named for the river and pass, is located not in the Canadian Rockies but across the Rocky Mountain Trench in the Dogtooth Range of the Purcell Mountains, on the other side of the town of Golden. The Kicking Horse River begins at the outlet of small Wapta Lake and flows southwest. It receives the Yoho River upstream from Field. The river continues to flow southwest until after it drops over Wapta Falls, when it takes a near hairpin turn and flows northwest into the Columbia River in Golden. The river has three waterfalls along its stretch. The first is the Kicking Horse Cascade, a long talus cascade which occurs just below the first highway crossing of the river below Wapta Lake. The second is the Natural Bridge Falls near Field. The final and largest is 100-foot (30 m) Wapta Falls, one of the largest waterfalls in Canada in both volume and width. They are over 500 feet (150 m) wide. 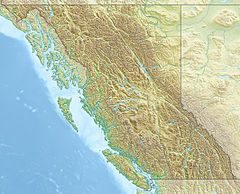 As surgeon and geologist to the Palliser Expedition from 1857 to 1860, Hector explored the country from the Red River Colony (Winnipeg) to Vancouver Island. He made many important observations regarding the geology and ethnology of the Canadian West and the Rocky Mountains, discovering the Kicking Horse Pass and giving the Kicking Horse River its name. On 4 February, 2019, a Canadian Pacific Railway freight train with 112 cars and 3 locomotives derailed near the Big Hill of Kicking Horse Pass. The train landed in the river, and three crew members were killed. Several whitewater rafting companies, as well as kayakers and canoeists, use the river. The first company to raft the Kicking Horse river is named Kootenay River Runners. They continue to raft trips on the Kicking Horse daily, as well as two other nearby rivers. There are three main sections of the Kicking Horse River used for such recreation. The upper canyon (accessed via Beaverfoot Road off Highway 1 West) is a class 3-4 whitewater run suitable for canoes, kayaks and rafts. Prior to a landslide in the upper canyon, boats had to portage a one kilometre stretch of rapids in order to avoid getting caught on rocks. After the landslide, the river was narrowed, allowing boats to pass freely through the rapids. Nowadays, this stretch is named Portage/Shotgun, hence the previous need to portage the area. The middle canyon (accessed via Kicking Horse rest area) is a class 4-6, depending on water levels. This run is suitable only for experienced kayakers and rafters. Commercial rafting companies avoid this section, due to the risk involved. The lower canyon is another class 4-5 whitewater run that is run by commercial rafting companies at suitable water levels. Prior to the start of the 2016 rafting season, Canadian Pacific railway installed a gate, prohibiting road access to the lower-canyon. Because of this, many rafting companies have been forced to stop rafting this portion of the river, resulting in revenue and job loss. The Kicking Horse is home to many varieties of freshwater fish, making fishing a viable activity. Wikimedia Commons has media related to Kicking Horse River. ^ "Kicking Horse River". BC Geographical Names. ^ Feb 06, CBC News · Posted:; February 6, 2019 10:35 AM MT | Last Updated:. "Fatal train derailment: A closer look at what happened that tragic day | CBC News". CBC. Retrieved 2019-02-20.